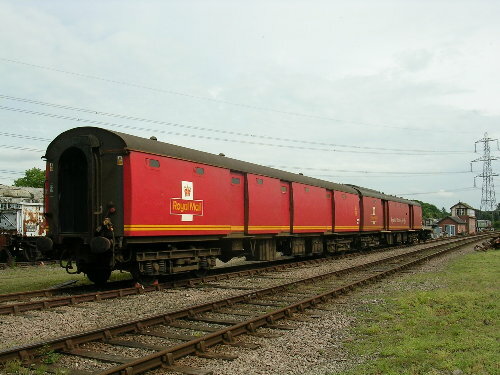 80438 is an example of the final type of Travelling Post Office Tender vehicle which replaced 70268E. Built at York in 1967 it was part of a batch of tender vehicles built to the later design (with smaller windows), and never had steam heat or vacuum brakes. In later years running on the West Coast Main Line it remained in service until the end of TPO operation in January 2004. An RVP member purchased it in 2006 to make our Mark 1 TPO train up to four coaches (representing all of the vehicle types). It remained at Euston awaiting delivery until 2008, when it arrived on the GCR. Its restoration to working order involved the fitting of vacuum brake equipment. It entered service in July 2009 and runs with 80301, 80349 and 80458 as part of our Mark 1 TPO project. A repaint in 1960's Royal Mail red livery is planned for late 2009.